Who was the real Saint Valentine? As you learn about him, you will create this interactive foldable booklet for your Interactive Notebook or Lapboook. 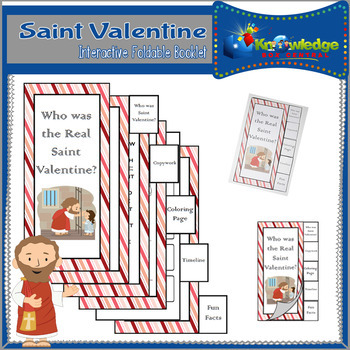 • Who was Saint Valentine? This product is a downloadable ebook in PDF format. Just follow the instructions as you print, cut, fold, glue, and create! Want to get ALL of our Valentine's Day Products together for one low price? Grab our Valentine's Day FUN Interactive BUNDLE for ONLY $4.99! You get all 5 products at one low price! Regular Price: $13.00.